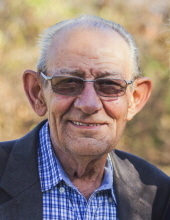 Johnnie Lee Fowler, 77, passed away on Sunday, March 24th 2019 at OU Medical Center in Oklahoma City. He is the husband of Fredia Fowler. They shared 57 years together. Johnnie was born in Wilson Oklahoma on February 19, 1942 to Floyd and Edna Fowler. He was raised in Elmore City Oklahoma and attended Elmore City High School where he graduated in 1960. He was a member of Calvalry Holiness Church in Midwest City where he was a brother to many who attended. Johnnie loved being an electrician and retired from his trade in 2007. He will be remembered by all for his willingness to help those who needed it. There was never a time he did not offer to help family, friends and strangers alike. He is survived by wife Fredia Fowler. Brother Bill and wife Ruth Fowler. Children Kim and husband Ken Widener, Scott and wife Kendal Fowler. Grandchildren, Brent and Allie Widener, Kellee and Brian Bouchard, Sarah and Jake Rhine, Paige, Regan and Caleb Fowler. Great Grandchildren Emma and Wyatt Widener, and Tucker Bouchard. The funeral service will be held at Bethel Church in Choctaw Oklahoma at 10:00 am on Thursday March 28th 2019. The graveside service will be held at Sunrise Cemetery in Kellyville Oklahoma at 3:00 p.m. the same day. To send flowers or a remembrance gift to the family of Johnnie Fowler, please visit our Tribute Store. Family will be available to greet friends. "Email Address" would like to share the life celebration of Johnnie Fowler. Click on the "link" to go to share a favorite memory or leave a condolence message for the family.